The Getty Research Institute in Los Angeles was founded in 1983 as one of the Getty Trust programs. These include the J. Paul Getty Museum, the Getty Conservation Institute, and the Getty Foundation. The Getty is a private non-profit institution administered by the Getty Trust; current president is art historian Dr. Jim Cuno. Under the leadership of Director Dr. Thomas Gaehtgens, the GRI’s staff is approximately 220 art historians, librarians, curators, conservators, digital specialists, photographers, and indeed, artists. They research, conserve, and provide reference assistance to the GRI collections, which are accessible around the world via the online catalog and increasingly, through digitized collections. Annually, there are approximately 60 invited Getty scholars, fellows, and graduate interns, as well exchange staff, in addition to more than 6000 readers. Each year has a scholarly theme intended to stimulate debate and new research. The subject in 2003-4 was Markets and Value; this year’s theme is Iconoclasm and Vandalism. All collections—the Research Library and the Special Collections—focus on art history and related areas of visual culture. While the library seeks to be a global art research collection, the Special Collections are acquired selectively. Media include rare books, photographs, and prints; drawings, such as artists‘ sketchbooks; architectural plans and models; comprehensive archives; manuscripts, such as artists‘ letters; multiples and contemporary media, such as audio recordings and videos. Core areas are the history of collecting, provenance, and artists‘ archives as well as those of related art-world professions, such as architects, curators, conservators, art historians, dealers, and gallery archives. 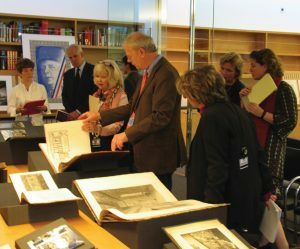 To promote research and public comprehension of art history and the special collections, the GRI has an impressive array of public programs, publications, and exhibitions. Every year hundreds of loans to international museum exhibitions bring GRI collections to new venues around the world. 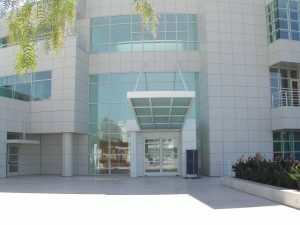 Entrance to the GRI. Copyright: Getty Research Institute. 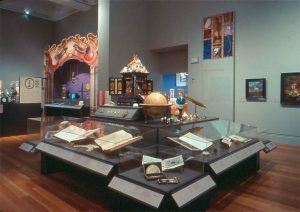 Devices of Wonder, the 2001 exhibition at the Getty Center, based on the Nekes collection. Copyright: Getty Research Institute. Presentation in the Special Collections Reading Room with Dr. Thomas Gaehtgens and Marcia Reed, viewing manuscripts and sketches of the Düsseldorf Gallery. Copyright: Getty Research Institute.